The game room at the Roxie Spokane in Hillyard. Live jazz tickles its way through the glass doors at the Roxie event center, where there's a surprising number of people inside drinking and having a good time for a Monday night in mid-December. 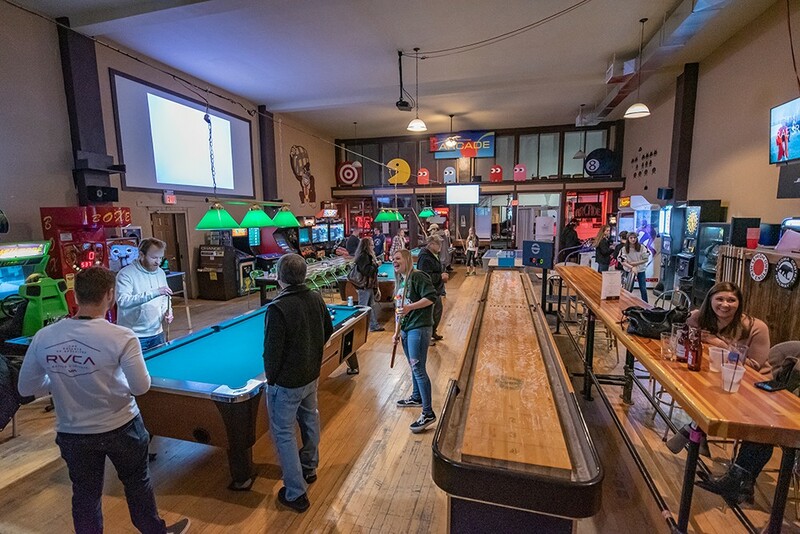 Slip past the private party revelers into the next room, and there's an adults-only arcade, filled with pool tables, shuffleboard and video games for the 21-and-older crowd to enjoy. Dip around the corner through a narrow hall, and a handful of people sit sipping their drinks and watching sports in the Northern Rail pub. But that barely covers what's happening just on the ground floor of the nearly 40,000-square-foot space, once a Masonic temple. Back on the Market Street side of the building, head upstairs and there's another bar on the mezzanine, where more private party guests mingle, perhaps unaware that the floor above them opens into a massive space that can comfortably hold 500 people. In just a few days, the community will fill that room for the Roxie Family Country Christmas meal, with 125 tickets donated to lower-income families in the area. Meanwhile, in the basement, three of the building's four owners help a showrunner prepare for an EDM (electronic dance music) show set for Friday night. It's a mix of events, people and sounds that only a space as big as this can really accommodate. And with their sights set on giving back to the community while giving Hillyard a good name, the Roxie's owners hope to help do for their street what other restaurants and businesses did for the Perry District and Kendall Yards. "I feel like we're championing the neighborhood," says Gil Rivas, one of the co-owners and the main music and private-event booker. "The perception of Hillyard has to change, and you have to have one hard-charging venue that helps change that, and that's us." 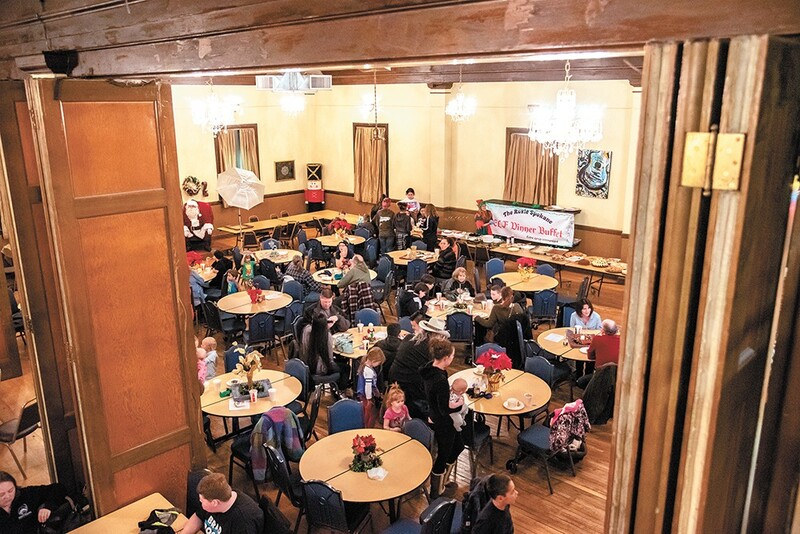 The Roxie served up a Christmas meal for area low-income families. When Dwayne Alexander bought the building about two years ago, he says there was a church leasing the basement, but the upstairs had gone largely unused for decades. "When I got it, all the walls were painted black and these giant doors were laying on the ground in a big puddle of water with tarps around 'em," Alexander says, gesturing to massive wooden doors that once again stand ready to separate the largest upstairs event space into two rooms. The church moved out, and he set to work replacing and repairing the plumbing and electrical, and installing sprinklers where needed. He also acquired the connected Northern Rail pub and its large patio out back. Alexander decided to name the space after his mother, Roxie, who lives in Asotin. "My mom just has always been behind me," he says. "She's a strong person, someone who believed in me." The goal for the Roxie Spokane is to host at least one major music event each month — everything from jazz and blues to country, grunge and dance music — and then get outside event runners to offer even more entertainment by renting spaces and promoting their own shows. The venue has hosted everything from wakes and weddings to mixed martial arts and boxing matches, Alexander says. "We're in the square-foot business," Rivas says, noting their space is the largest of its type in Spokane. Uniquely, Rivas and Alexander say, they'll let people "spend down" the cost of renting out the space. "So if you rent the venue for $2,000, and then your bar and your food bill rings out at $1,500, you only owe us $500," Rivas says. In addition to repeating some of their successful shows from 2018, including a popular country festival in March, Alexander says this summer the Roxie will also host outdoor concerts and free family movie nights in a park space he owns about a block away. There's something going on every night of the week, from karaoke to a shuffleboard league. One of the most popular events has been a quarterly music challenge that gets local artists to compete for the chance to win a trip for two — most recently to Cancún. "We're an eclectic venue," Rivas says. "You can do so many things here. The Fox and the [Bing], those are bigger in terms of seating for concerts, but that's the only thing they do there. They can't host all the things we do." Most recently, the Roxie's owners have focused on building out a full-service kitchen to cater to events in the building, and serve a restaurant they hope to open in the spring. "If you're not in the mood for Chinese food, you're pretty much out of options as far as what you can eat in this area," explains Hector Torres, one of the owners and the chef spearheading the restaurant. Torres, who is Cuban-American, says he wants to focus on making healthy food that is sustainable and accessible to people. "The vision is to be able to be the standard in the community for good food, not just in quality, but also in sustainability as far as where we're sourcing our products," Torres says. "I want to teach people to eat things as they come in season, what comes in season at fall and why is our menu different in the fall than it is in the spring. This is part of the sustainability." He envisions that once the restaurant opens, there'll be a one-page menu of staples, and a rotating fresh sheet with seasonal dishes. The restaurant will be just the latest push at the Roxie to help revitalize Hillyard. With nearby North-South Freeway construction pushing ahead, and area streets and sidewalks already upgraded, Hillyard is primed to drop its reputation for poverty and crime, and Rivas says the Roxie is poised to help make the tides rise for all neighboring businesses. The original print version of this article was headlined "Rising Tide"